After weeks of rain and promise of a sunny weekend it seemed like everyone had made their minds up they were heading for the last camping trip before Winter. Coorongooba campground in Wollemi National Park beckoned and we headed off a day before the Easter break. The campground lies in the Capertee Valley, reputed to be the widest canyon on the world (not the deepest), approximately 135 km north west of Sydney, and is accessed from the village of Capertee. The final 10-12km are covered across dirt road, through private property at one stage, leading through eucalypt forest onto a gently sloping grassy area, home in quieter times to a sizeable mob of kangaroos. We saw them on arrival but as the hordes started arriving they disappeared back into the solitude to be found in the forest. The Capertee river runs below the campground, offering shallow pools for young kids to play in, and within a short walk deeper pools for the adults to swim in. The campground was also punctuated with many wombat burrows too, and these animals waited until after most folk had retired at night before emerging to graze on the grassy areas. A bright moon helped spotting these creatures, though they could be heard quite clearly grazing close to the tents. Simon (110AroundOz) took us on a drive to the Ben Bullen 4WD track, a very picturesque drive that follows a ridge through the hillside, then into a narrowing canyon that requires a steep climb out across a rock face at Baal Bone Gap on the track. Photos don’t do it justice and we didn’t have the time to complete the track and were content to watch trail bikers flying up instead. A challenge for another time. The trip coincided with Gemboree too, in nearby Lithgow, so we had an excursion to see one of the largest gem shows in the country, immersing ourselves in all things lapidary for a few hours. This area has so much to offer, with some beautiful, highly accessible National Park campsites such as Newnes in the Wolgan Valley and Dunns Swamp to the north, as well as private camps like Turon Gates. Unfortunately, they are no secret and Easter holidays brought crowds that resulted in daily morning queues for the two toilets that were up to ten deep for several hours. Shortly after leaving Armidale we chanced upon a sign to the grave of Nat Buchanan who died at the age of 72 in 1901. Like we did, you are probably wondering who Nat Buchanan is, but we discovered that after arriving in Australia from Ireland in 1837, he went on to create an unrivalled reputation droving cattle. The plaque next to the grave explained all his feats and having visited some of the areas he was droving we could well appreciate the achievement. Driving further along the road in the Northern Tablelands another sign triggered me to turn off to the Apsley Falls. I had read about these and also was keen to see what the Oxley Wild Rivers National Park had to offer. 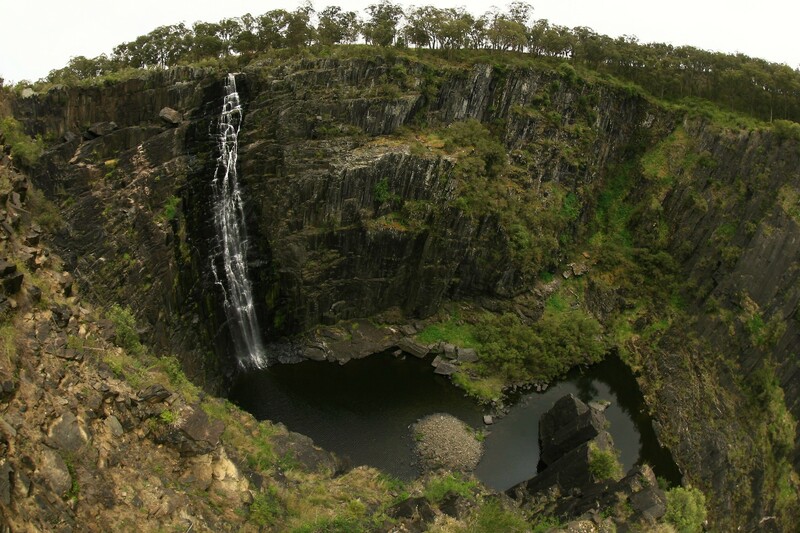 Two sets of falls plunge some 60m into the precipitous Apsley gorge and a series of lookouts offer some amazing vantage points to watch. The water levels were low and the river disappears beneath rubble at one point re-emerging around the next bend in the gorge. Mooraback camp is a quiet oasis that lies in Werrikimbe National Park, and adjacent to the Oxley River National Park. Classified as a Gondwanaland forest, it is the remnant of forest from the supercontinent of the same name that split into the continents that we know today. The homestead was handed over to the National Parks in 1975 and is now critical habitat to a number of endangered plants and animals, including the River Hastings mouse. This rodent was believed extinct for over 100 years until rediscovered here in the 1980s. Reaching an altitude of up to 1200m on the drive up it was quiet a refreshing change, from the mid 30 degrees of the previous day, as temperatures dropped to a brisk 16 degrees. Driving into the clouds we were regularly sprinkled with fine drizzle. On arrival we had choice of the 5 sites, all recently mowed luscious green patches dispersed amongst the trees. A fire-pit and supply of wood offered us probably the last opportunity to have a campfire on this adventure. As daylight vanished and everyone else disappeared into bed the forest suddenly lit up with tiny flashing lights, and for 30 minutes a display of fire flies flitted gracefully between the trees in the forest in pursuit of one another. Hannah was still awake and came to watch this magical finale to our trip with me. From the camp there are two easy walks, one takes you through a number of habitats in the forest behind. This 15 minute walk showcased many local birds, crimson and eastern rosellas, white-eared honeyeaters, golden whistlers, rufous fantails, red-browed finches, fairy-wrens, silver-eyes, and treecreepers. 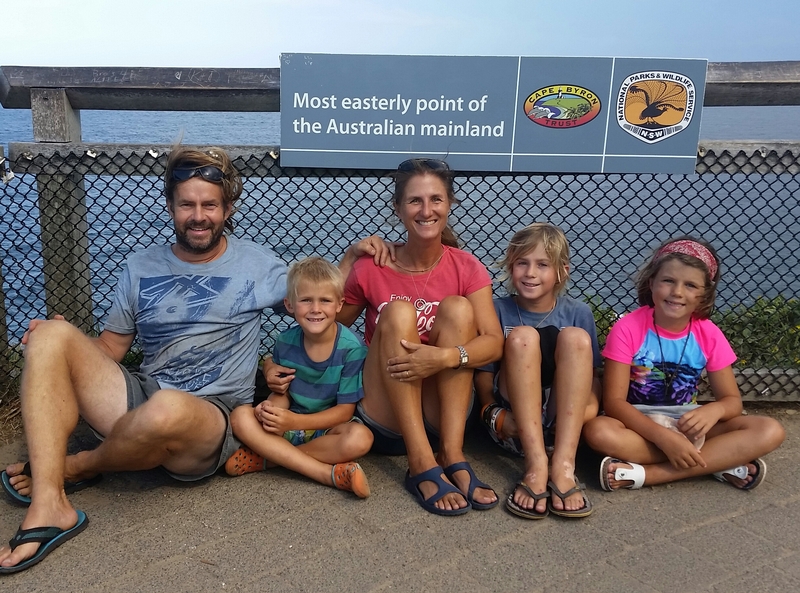 The second walk is a 5km walk that takes you around the headwaters of the Hastings river that runs towards Port Macquarie, where it finally meets the Pacific Ocean. The streams and pools abound with platypus and Xavier and I were fortunate to see a number of them in the late afternoon. The hillsides up in this NSW alpine region abound with colour at the moment and we had fun spotting many different spring flowers, including a few different orchids. When the clouds finally cleared and the sun emerged this place was a truly tranquil gem and worth driving the additional kilometres from the main road to visit. One last night, and time for a final episode of the “bushman’s TV”. Each episode lasts as long as your wood supply, and though often similar, are equally riveting for young and old with every viewing. The last of the kid’s houses built from firewood were sacrificed, another display from the fire flies and it was time to farewell this remote spot. The last challenge for us was to stand on the last of the compass points of mainland Australia. In the South, a year ago, we had hiked 40km in 2 days to South Point. In the West an arduous drive took us some 32km along a hideously corrugated sand track to Steep Point. Only a few weeks ago we had stood at the Tip, (Pajinka) on Cape York, in the North and the last challenge was Cape Byron on the East. This had to be the easiest part of our challenge. We parked car and trailer and walked 15 minutes up the hill past the lighthouse to the sign. Once again a storm threatened but on our return we hesitated on the cliffs to watch a manta ray glide past. We also witnessed a shark, eagle rays and dolphins cruisng close to the shore before we dashed to miss the rain. But wait a minute I’m getting ahead of myself!! Leaving the Gold Coast we took a scenic drive inland through forests to a place called the Natural Bridge in Springbrook National Park. A short trail through forest takes you to Cave Creek that falls over a rock wall then through a cave making it a photogenic “Natural Bridge”. The river passes several plunge pools before cascading over a large log into a glowworm cave, then flows out to the forest again. The glowworms are only visible at night unfortunately when their green light fills the cave. Another feature of this part of the park are the Hoop Pines, primitive conifers that have existed for 180 million years. Our itinerary was busy and as we pressed on again, then suddenly on a narrow winding country road we were confronted with a sign that grounded us. “Welcome to NSW” meant we were truly almost home. 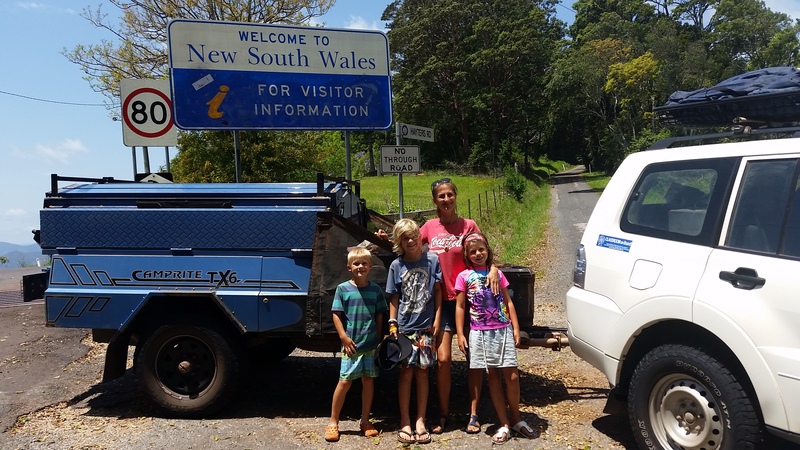 We left NSW over a year ago. Our next stop requested by the kids was Crystal Castle in Mullumbimby. I wasn’t prepared for what greeted us, but mirth soon overtook apprehension when our guide paused for an unexpected moments meditation. The kids slurped their drinks loudly (we were lunching on the run again). I poked them in the back, half opening my eyes to see if anyone had heard but they didn’t get it and kept slurping. I hung my head for a minute in embarrassment, then let go, relaxed and enjoyed the sumptuous grounds. Giant statues of Buddha and numerous Indian gods occupy strategic positions throughout the Shambhala gardens. Enormous crystals offer healing qualities, and a world peace stupa allows one to close your eyes and pretend you are in Tibet. There is a rainforest walk, regular events, and niches where people seek tranquility for a spiritual experience. Much work and collaboration has been required to develop this place and it is well worth a visit. After a couple of hours here it was time to close the compass point challenge and Byron Bay was our next stop, unfortunately having no time to stop to see our fellow travellers “Our Roaming Home”, who started from our home suburb shortly after we left. They had seen us passing and called Amanda on the phone! With light fading fast we headed for our camp at Lis and Greg (friends of Amanda’s brother) in Lennox Heads, put the trailer up and the deluge began. As hailstones began to rattle the roof on the house I hoped that they wouldn’t be big enough to damage the car. The kids were fascinated with them as they haven’t seen hail for a long time. Finally we sat in the house watching Malcolm Douglas episodes on TV, a rare event in the last year, until it was time to retire to bed. As far as we could go! The following day saw us heading north to Sandy Cape, up past Indian Head, Waddy Point, through the cute settlement of Orchid Beach, before heading up the beach again. With the tide being quite high on the way up we had to briefly leave the beach at Ngkala Rocks taking a bypass track that squeezed us through the rocks. We spotted two more dingos on this trip and at Sandy Cape the road to the lighthouse was impassable due to the tide, so we took to foot to walk over the dunes to the Carree campsite. The tall sand dunes plummet to the seashore and the kids ran up and down in the hot sunshine whilst we watched. The lighthouse poked out from the trees several kilometers to the west of us but too far to walk in the heat. On the return trip we visited the Champagne Pools, somewhat disappointing due to the fact that each pool had fifty backpackers wallowing in it, some of them stripping off and crushing snails to feed the fish, despite the “no collecting” signs. When challenged one said he was with an Aboriginal who said it was ok to do so. Whilst indigenous people do have privileges to collect within National Parks, tourists don’t and when others started copying the marine life will soon be stripped and spoilt for the future. I found it surprising that the indigenous guide had allowed this, as most aboriginal people we have met consider themselves to be guardians of the land they occupy. In this case perhaps the lure of the dollar was more important than preservation of the environment. We walked to the tips of Waddy Point and Indian head to look for sharks, turtles and more but returned disappointed. On the return trip we headed east at Orchid Beach to visit Wathumba, a large estuarine area, with a wooded coastline and mangroves growing in the sand. This beautiful spot is notorious for sandflies but we didn’t witness many at all. Another day, another excursion and we headed south to take in the Central Lakes drive. Out timing of the tide wasn’t good and when we arrived at Eli creek some thirty cars on both sides of the creek were awaiting the tide to abate. Some of the Tag-Along tours had fixed itineraries though and were not prepared to wait. The 4WD vehicles driven primarily by inexperienced backpackers nervously entered the water, sometimes to their leaders horror even taking a precarious passage over rocks. Whilst the water wasn’t too deep I was prepared to wait a bit longer rather than taking a brine rinse under the bonnet. One vehicle stalled on the exit and couldn’t be restarted by the driver. Without a snorkel it looked like this could be the end of their day but the leader emerged from the back of his vehicle with a can of CYC spray and with a prolonged spray under the bonnet life was restored in the engine and off they drove. As we crossed shortly after four guys were digging sand out from the wheels of a very bogged car near the front of the queue. Oscar looks through a tree! Once across the creek and past Yidney and Poyungan rocks along the beach the track heads inland and a short drive through the forest brings you to the Lake Wabby Lookout. The lake is easily accessible from here and despite the threats of a dark storm approaching we couldn’t resist. The water was surprising warm for the deepest lake on the island and with steep dunes plunging into the deep water it was a favourite with the kids. Beyond that is another major attraction, Lake Mackenzie, whose brilliant white sandy shores and pale blue acidic water grace all the tourist brochures. To avoid crowds, a short walk along the beach, and over a few steps, brings you to a second beach. Still no sun but plenty of crystal clear warm water to swim in – irresistible. The drive continued past Lakes Birrabeen, Benaroon and Boomanjin, all picturesque and much less frequented by the crowds of tourists but time was flying and we had to drive back up the beach. 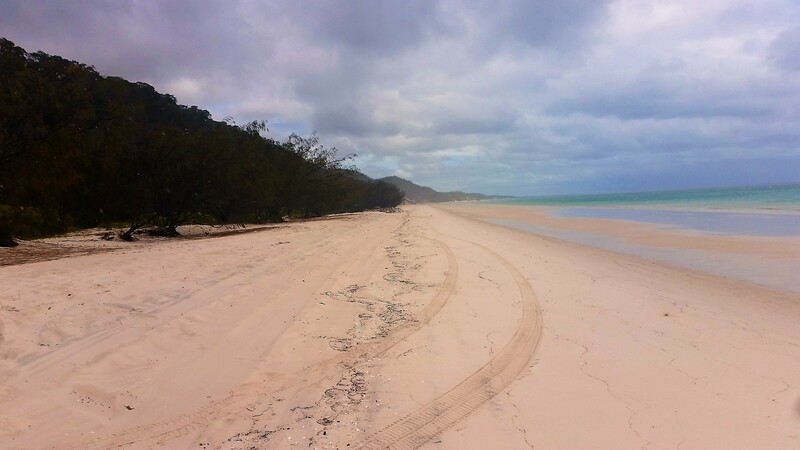 After over a week’s unscheduled stay in Noosa it was time to revisit our last major 4WD challenge of our trip, Fraser Island. Having visited twice previously the plan this time was to explore beyond the typical tourist attractions. Previous trips had been restricted to 3 days and had seen us staying on the south east side of the island exploring only half of one side of the island. 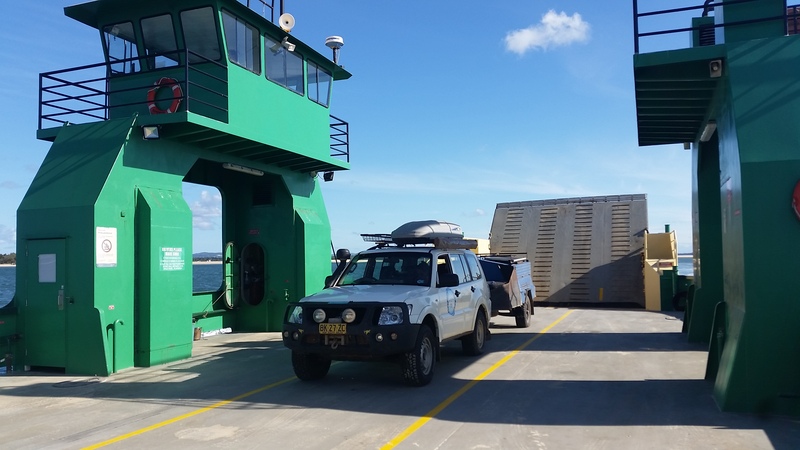 The ferry terminal at Inskip Point is a beach of soft sand 100m from the unsealed road. As we drove onto the beach the ferry had just departed, but as I accelerated across the beach the skipper must have seen us, reversed and returned to pick us up. The ferry was empty so we got our own personal ferry service which made it seem worthwhile considering the rather pricey cost for a 5 minute crossing. The deckhand joked that he would save us a place on our return trip in a week’s time. We had timed the tides well and drove from Hook Point along the beach and up the eastern beach, some 65km to Yurru campsite, just north of Cathedral Beach camp. The beach is under normal road regulations with a speed limit of 80km but following recent rain the unwary can be caught out at this speed with washouts. Despite being the largest sand island in the world, over 100km long and 20km wide, there is no shortage of static and flowing freshwater and the erosion of beach sand caused by creeks can cripple the suspension of even the most sturdy cars if hit too fast. Driving up the beach we were treated to the sight of two inquisitive dingos, then as we approached the Eurong settlement six dingos including young pups were running around the vehicles of some fishermen. Nothing beats the traditional dingo welcome to Fraser island. A ban on dogs on the island has retained the pure-bred status for these dingos as inter-breeding often occurs back on the mainland. Shortly before Yurru camp the majestic wreck of the Maheno emerged through the sea spray in the distance. The Maheno sank in 1935, washed ashore in a cyclone, but sufficient remains make it an interesting stopping point for tourists. Original wooden decking still lines some of the wreck, even after exposure to daily tides and the occasional cyclone storms over the last eighty years. On our first day a transmission warning light came on and when actions recommended by the car manual failed to rectify it we were in a bit of a quandary. It still drove so we chose to ignore it until we got off the island again! With a very changeable and wet long range weather forecast we chose to explore as much as we could in the first two reasonable days. The northern forests scenic drive took us initially to a lookout over Knifeblade sandblow where the tops of overrun treetops poked starkly out of the sand. Lake Allom, further inland offered a warm refreshing swim amongst the freshwater turtles. We then took a couple of tracks to explore the western coast, Awinya and Woralie creeks. With a prevailing easterly wind, it was nice to experience calm beaches with no surf on the western side of the island. The camp at Woralie was very attractive though the creek crossing was very deep and not one that we were prepared to attempt. We were half way across when I decided it needed to be waded and when the water reached my chest I was glad I hadn’t proceeded. It was fun to watch a car coming the other way, without a snorkel, as the bow wave poured over the bonnet and up their windscreen. We explored another track that headed towards Moon Point but not being the scheduled track resulted in many scratches and a nasty ding in the side of the car. To add insult to injury the last 7km to Moon Point were closed. The track leads through magnificent forest, where mature trees dwarf the cars as they pass through. Giant Kauri trees give way to lower scrub and the outlook continually changes. The narrow roads are restricted to 30km and constantly keep the driver busy negotiating the way through natural obstacles and fallen trees can easily halt progress. We had organised a catch up with my cousin and his partner at 1770, one of his favourite fishing and camping spots. As a special bonus my aunt was driving up with them too. 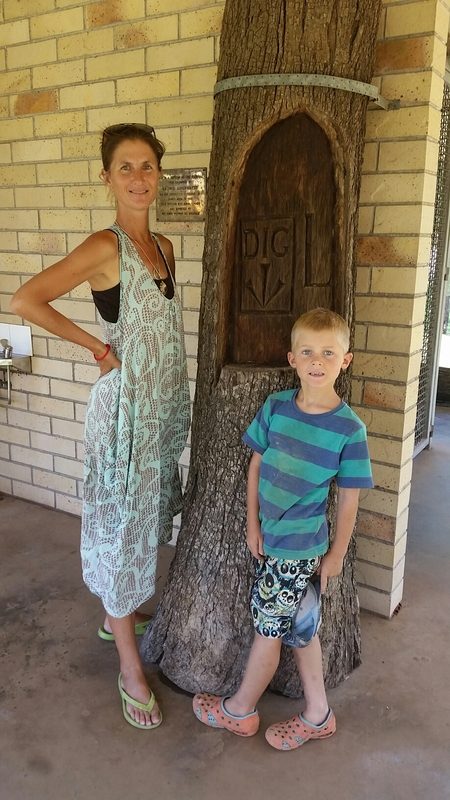 Leaving the gem fields on the Capricorn Highway we very quickly arrived at the town of Comet, famous for the Leichhardt Dig Tree. In 1844 the explorer Ludwig Leichhardt marked a tree to indicate where his team had buried food and journals. Today a replica of the tree marks the point and made for a timely break. We also passed a collection of holding rusting car frames by the side of the road. 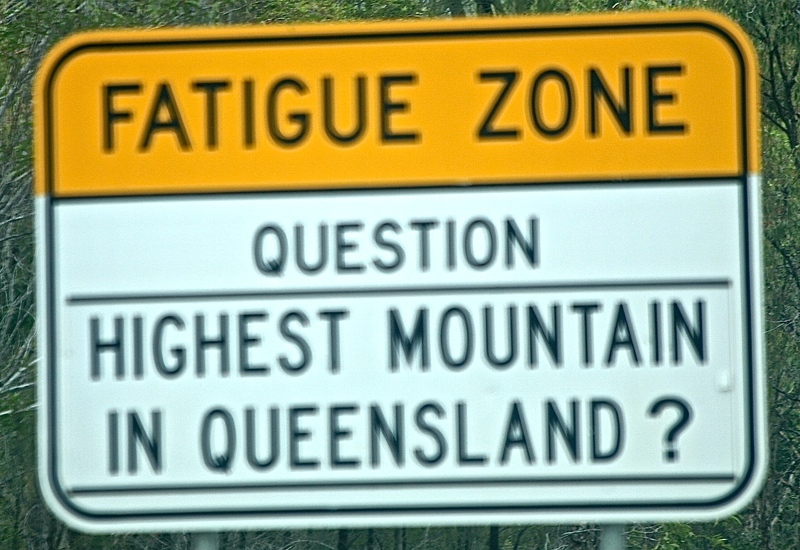 Along the Capricorn Highway there is a novel technique to reduce driver fatigue. 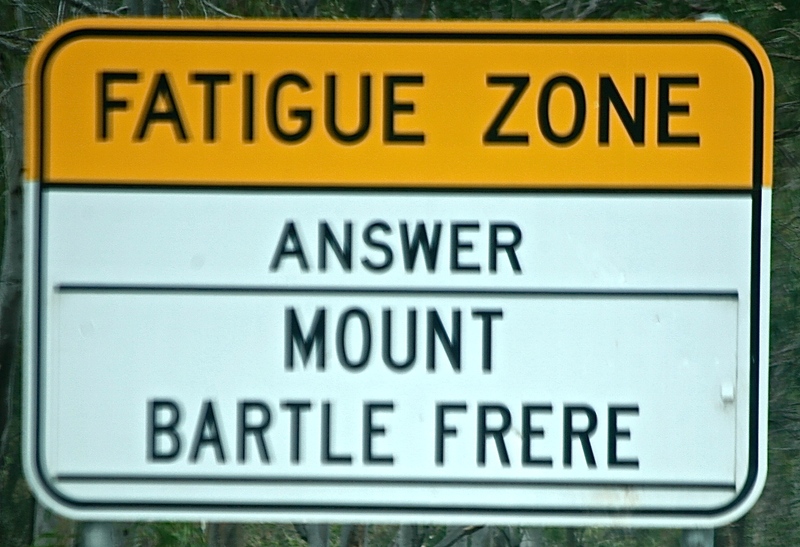 Highway Trivia questions are posed on signs to ponder with answers displayed several kilometres down the road. Whilst a great idea, the execution is poor as the questions don’t change, being fixed signs, and are destined to work only once. The village of 1770 was built where James Cook landed for the second time on the HM Bark Endeavour in May (the first being Cooktown), although it was only renamed from Round Hill in 1970 to commemorate the bicentennial of the event. Situated on a peninsula facing the Eurimbula National Park and Bustard Bay, to the west, it was nice to be protected from the prevailing easterly winds we had been exposed to at coastal locations. For us it was family time, catching up with my aunt, cousin and his better half. Hannah was keen to learn how to knit and my aunt patiently taught, then fixed dropped stitches time and time again as a woollen scarf grew by the day until complete. Xavier did what he loved, fossicking for treasures along the beach and Oscar and I joined my cousin fishing. My aunt Myra had devoted so much effort preparing food for the weekend that she forgot to bring her bag packed with her clothes so the girls went off shopping. Unfortunately there are not many shops but suitable beach attire was found, and duly christened, with much mirth, as the “Sausage Dress” due to it being located on a rack next to the meat in the general store. Myra treated us all to a trip on the famous pink LARC. These aluminium-hulled amphibious vehicles are LARC-V (Lighter, Amphibious Resupply, Cargo – 5 tons in weight) and were built in the 1950s in the USA. Our tour commenced with a 50m drive down the road then plunged into the river and across onto the beach on the Eurimbula NP side, where we were treated to a knowledgeable talk on the birdlife. The passion and local knowledge of our driver was welcome on a wet and overcast day, even the kids got to drive the LARC along the beach, sometimes even into the water. Back at camp we relaxed and talked, caught up on news, and even took my cousin Geocaching. The weekend flew by and before we knew it we were packing up once again saying goodbyes until we were due to meet up again further south. In a cruel and tragic twist, after such a beautiful weekend, my Aunt died on the return trip and our plans rapidly changed. Whilst feeling totally empty having been robbed of such a beautiful person so suddenly, we were lucky to have spent some great time with her, and our memories of that weekend will be cherished by us forever.